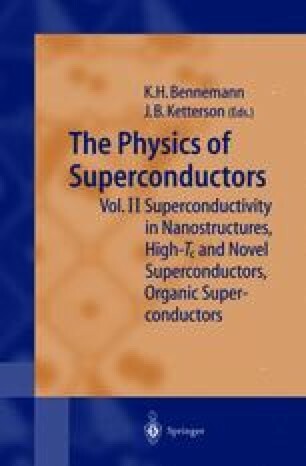 In 1911 Kamerling-Onnes discovered superconductivity in mercury at 4.2K, in 1933 the fundamental Meissner-Ochsenfeld effect (j s ∝ A) has been discovered and in 1957 Bardeen, Cooper, Schrieffer explained superconductivity using an electronic theory as resulting from the electron-phonon coupling (B.C.S.-theory). In many metals this interaction caused singlet Cooperpairing (k ↑, −k ↓) of electrons within an energy-shell of the order of 2ω D around the Fermi-energy ε F (ω D = Debye energy). The resultant superconductivity was described by an order-parameter Δ k having s-symmetry (Δ k = Δ). 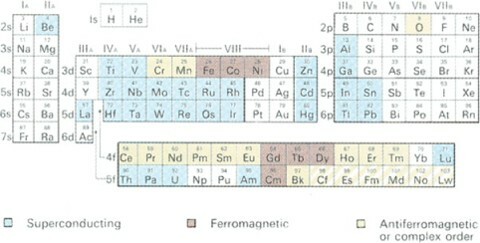 Most metals exhibited superconductivity below a relatively low transition-temperature T c and T c ≤ 20K . In Fig. 1.1 we illustrate the occurence of superconductivity in the periodic table.